It was fun experimenting with my first Chinese New Year chiffon! While admiring an angpow with the character "吉", I had the sudden idea that the centre of the chiffon tin could make up the "口". After trying out the Junko recipe for kawaii decoroll, I realized that the key to get a patterning batter of good consistency (not runny) was to add a little bit of cake flour into the patterning batter! 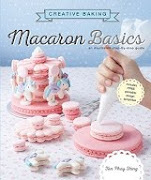 This helped a lot in the patterning of subsequent chiffon cakes. 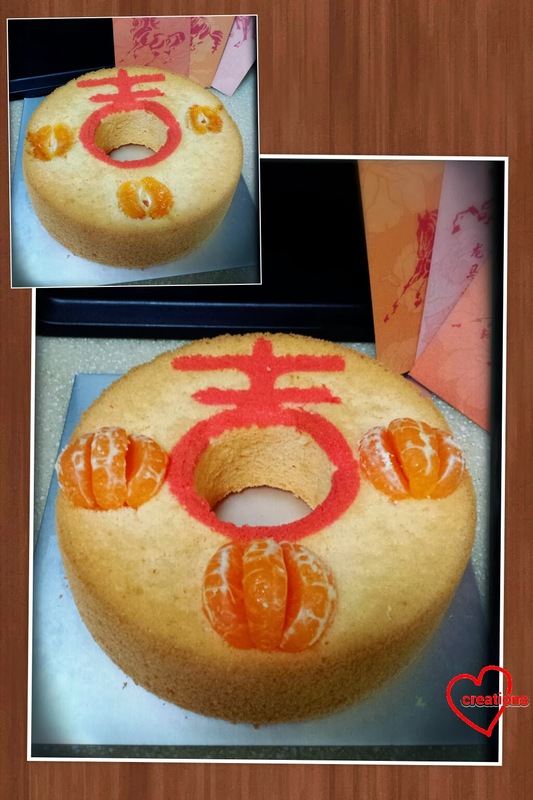 After piping in the "吉", I decided that I couldn't draw nice oranges, so I decided to bake part of the mandarin orange in the cake, then top up with more slices for a 3D effect. My hubby said that the mandarin oranges still tasted nice and sweet in the cake. 大吉大利 everyone! 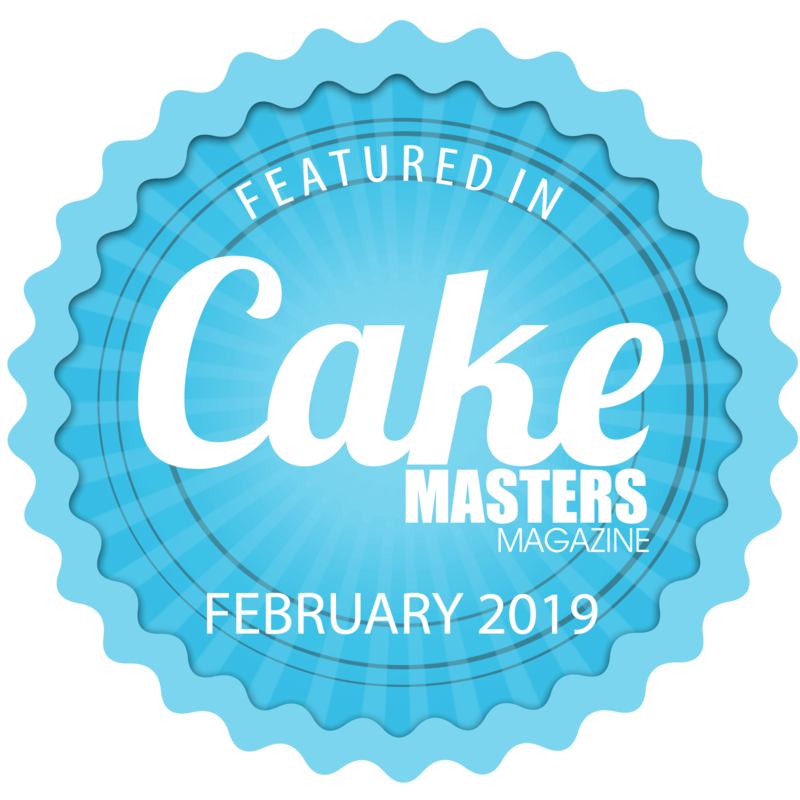 Recipe for this Mandarin Orange “吉” Chiffon Cake is now on Page 121 in my new cookbook Deco Chiffon Cakes, now on CNY promotion (20%) at Popular. 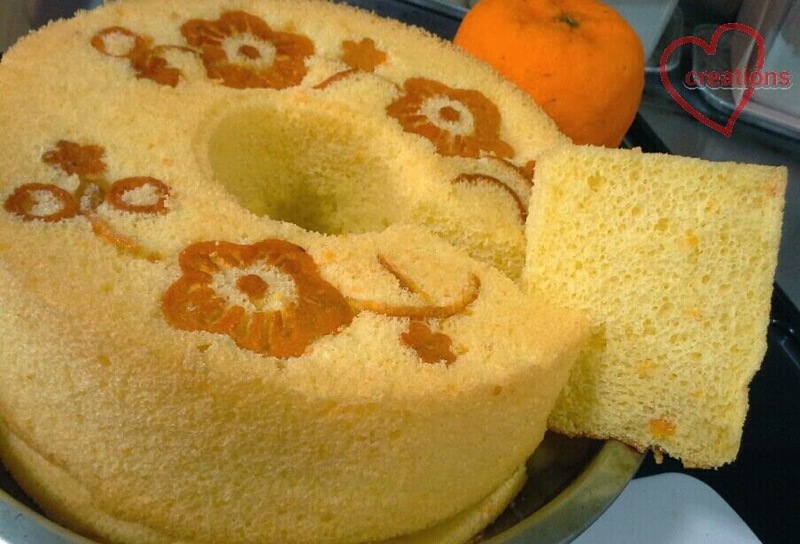 A neighbor wanted to learn how to make chiffon cakes because I have been offering her some and she loves these soft cakes that are full of flavor and not too sweet. 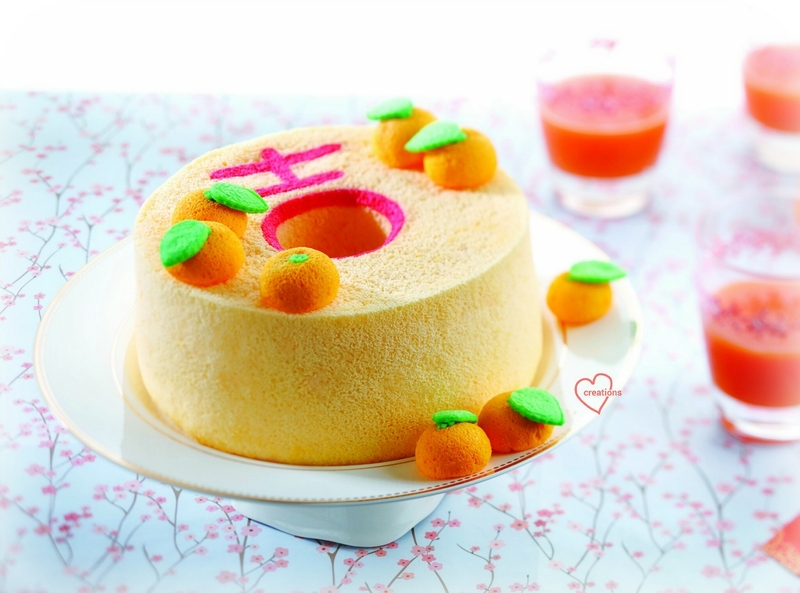 Since it is the Chinese New Year season and we are flooded with mandarin oranges, I thought why not make a mandarin orange chiffon. 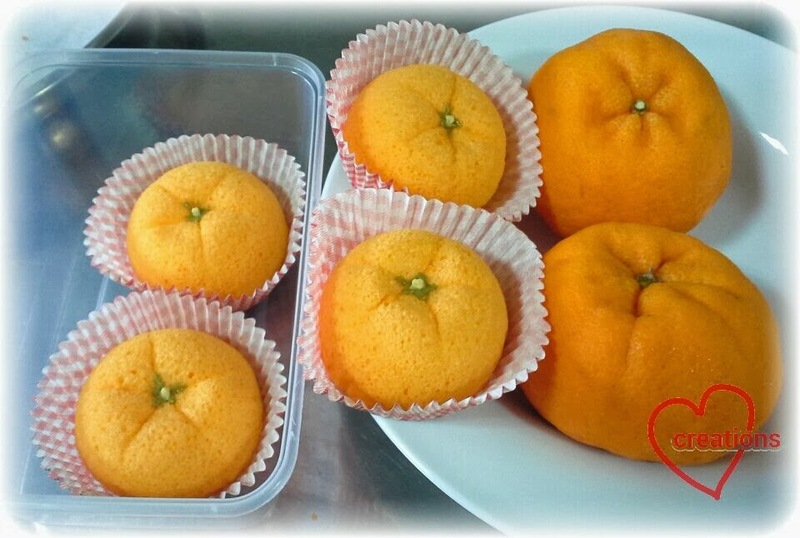 As she wanted to learn the basics and I wanted to play around with my bakes at the same time, I decided on using pre-cut orange peel to pretty up the cake so that my baking session with her will not be disrupted by funny things I do to decorate the cake. 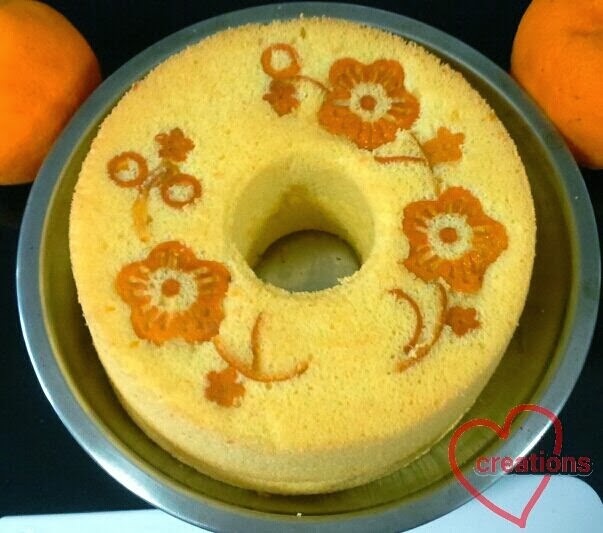 Here's my mandarin orange chiffon with orange peel flower decorations :). 1. Peel a mandarin orange and remove the pith (the white fibrous part of the skin) so that the peel will not be bitter when eaten. 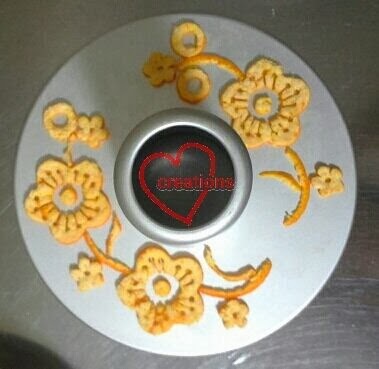 Use cookie cutters and a small fruit carving knife to carve out the shapes. Line the chiffon tin with the orange surface facing down. Keep in mind that your patterns will turn out laterally inverted so you have to be careful with patterns that involve forming words. I forgot to remove the pith for my first attempt as you can see from the photo below. The decorations turned out really bitter! 2.Preheat the oven to 160 degrees Celsius. 3. Whisk egg yolk and caster sugar until well combined. Add in oil, followed by orange juice and zest. 4. Whisk sifted flour and baking powder into the batter bit by bit until there is no trace of flour. 5. In a clean metal bowl, beat egg whites and cream of tartar with an electric mixer. When soft peaks are formed, gradually add in sugar and beat until stiff peaks are formed and the bowl can be overturned without the meringue falling out. 6. Add one third of the meringue into the egg yolk batter and mix well. Fold in gently but quickly the rest of meringue in 2 additions until there is no trace of egg whites. 7. 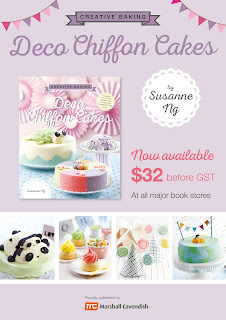 Pour the batter into the chiffon tin and tap the tin a few times on the table to release any trapped air bubbles. 8. Bake for 45 minutes. Immediately invert the chiffon tin to cool completely for about an hour. Remove the cake by hand for a cleaner and prettier cake surface. Use a spatula to dislodge any stuck sections carefully and only when necessary. Store the cake in an air tight container. 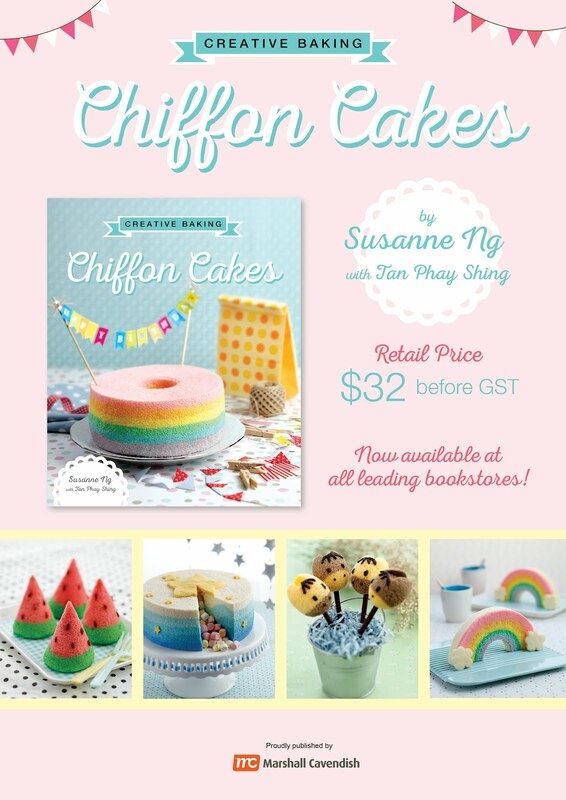 I personally prefer to refrigerate my chiffon cakes as they taste better that way :). Honey Pear Tea Chiffon "Pears"
Hubby bought some honey pear tea jam on offer so I made some chiffon cake with this flavor. Before I began, I thought why not make them pear shaped. It will be really cute and fun! Here's my chiffon pears, big and small :). I baked the big pears in the glass bowls that they are sitting in and the little ones in egg shells. Since the batter is already nicely golden yellow in color, there is no need to add any food coloring to make them look more pear-like. I adapted the recipe from Yuzu chiffon cakes, which are more common than honey pear tea. 1. Dissolve pear jam in hot water. Set aside to cool. 3. Whisk egg yolks and caster sugar until well combined. Add in oil, followed by pear jam dissolved in water. Mix in vanilla essence. 4. Whisk sifted flour and baking powder bit by bit until there is no trace of flour. 5. In a clean bowl, beat egg whites and cream of tartar with an electric mixer. When soft peaks are formed, gradually add in sugar and beat until stiff peaks are formed and the bowl can be overturned without the meringue falling out. 6. Add 1/3 of the meringue into the egg yolk batter and mix well. Fold in gently but quickly the rest of meringue in 2 additions until there is no trace of egg whites. Tap the bowl a few times on the table to release any trapped air bubbles in the batter. 7. Spoon batter into round-bottomed glass bowls (for the big pears) and egg shells* (for the small pears). Fill the glass bowls until they are about slightly more than half full and the eggshells until they are about 1/2- 2/3 full. 8. Bake for 15 minutes, then lower the temperature to 150°C for another 10-15 minutes. 9. Let the cakes cool completely before unmolding by hand. Store the cakes in an airtight container to prevent them from drying out. 10. Shape the small pears by wrapping each cake with cling wrap and tying a rubber band about 1/3 from the top as shown in the picture. Leave the rubber band on overnight. 11. Melt some chopped white compound chocolate over a double boiler and add in some green tea until the desired shade of green is reached. Keep stirring the mixture with a spoon until it is smooth. Transfer the green tea white chocolate into a piping bag with a No.3 Wilton piping tip. 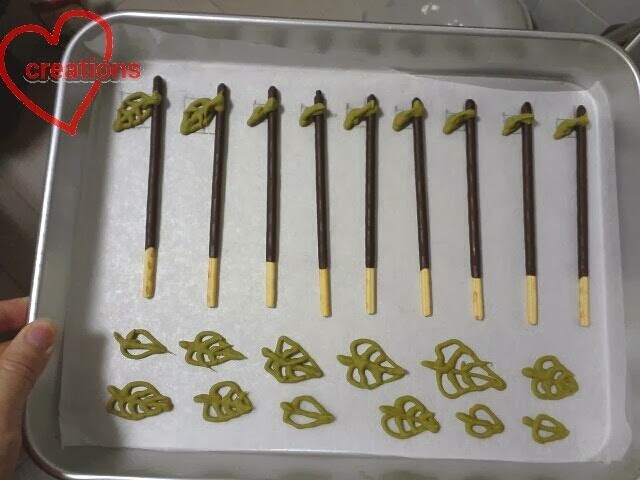 Lay out some biscuit sticks on a baking sheet and pipe leaves onto the sticks. When the chocolate has set, gently peel off the sticks. If the leaves break off the stems by accident, you may melt some milk chocolate to "glue" them back or use Nutella if you are feeling lazy. 12. Assemble the big pears by joining 2 cakes baked in glass bowls to form a sphere. Use a toothpick to make a hole from the top of the pear. Insert a biscuit stick with leaf attached. Break off the lower portion of the biscuit stick if it is too long. 13. 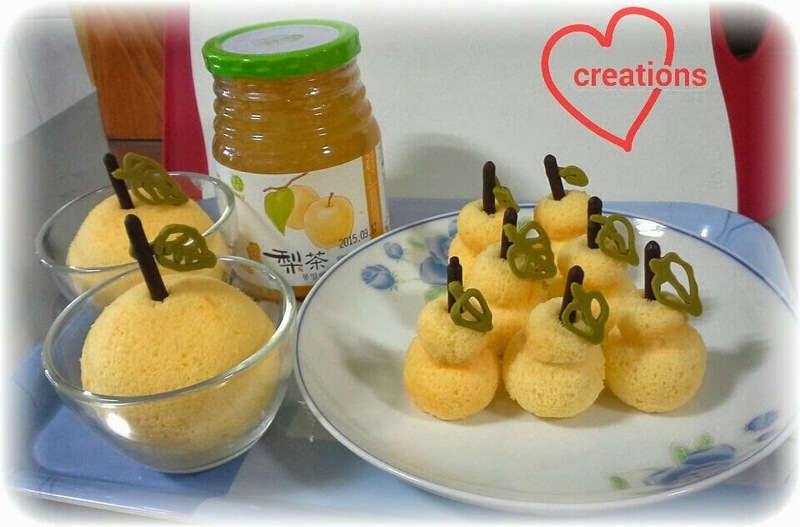 Assemble the small pears by using a toothpick to make a hole at the top of each pear and inserting a biscuit stick. I find the flavor of the honey pear tea in the cake not as strong as Yuzu even though the recipes are similar, probably because the honey pear tea jam is milder in flavor to begin with. Nevertheless, my neighbors had some of these and thought they are really cute! * Prepare the eggshells using the example shown by Susanne here. 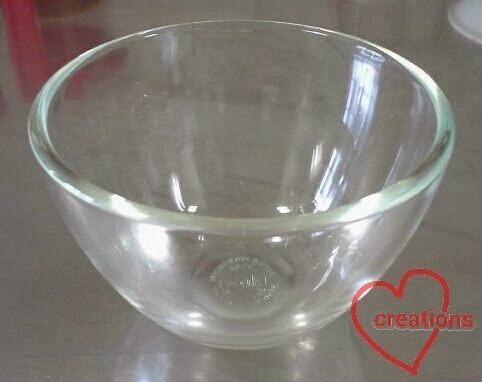 I baked the cakes in multipurpose round-bottomed glass bowls that are microwave/ oven safe. 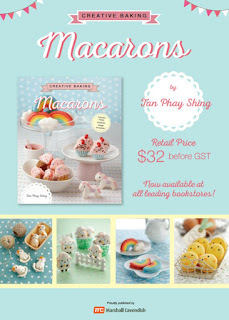 Dimensions are: height ~ 6.5cm and diameter ~ 9cm. You may also bake them in round metal or silicone molds. 1.Preheat the oven to 160 degrees Celsius. 2. Whisk egg yolk and caster sugar until well combined. Add in oil, followed by orange juice and zest. 3. Whisk sifted flour and baking powder into the batter bit by bit until there is no trace of flour. 4. Add orange food coloring bit by bit until a desired shade of orange is reached. Take note that the shade will lighten up considerably when the meringue is added in so you may want to make it a darker shade than desired. 6. Add one third of the meringue into the egg yolk batter and mix well. Fold in gently but quickly the rest of meringue in 2 additions until there is no trace of egg whites. Tap the bowl a few times on the table to release any trapped air bubbles in the batter. 7. Spoon batter into round-bottomed glass bowls. Fill the bowls until they are about slightly more than half full. 9. Invert the bowls immediately onto a cooling rack. (Update: this step of inverting the bowls is optional as I have realised from subsequent bakes.) 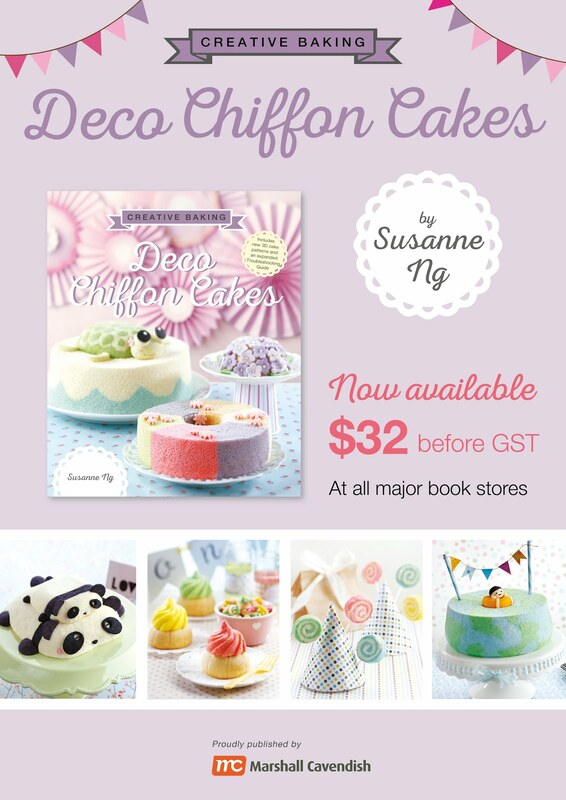 Let the cakes cool completely before GENTLY unmolding by hand as the cakes are very soft and fragile. Store the cakes in an airtight container to prevent them from drying out. 10. 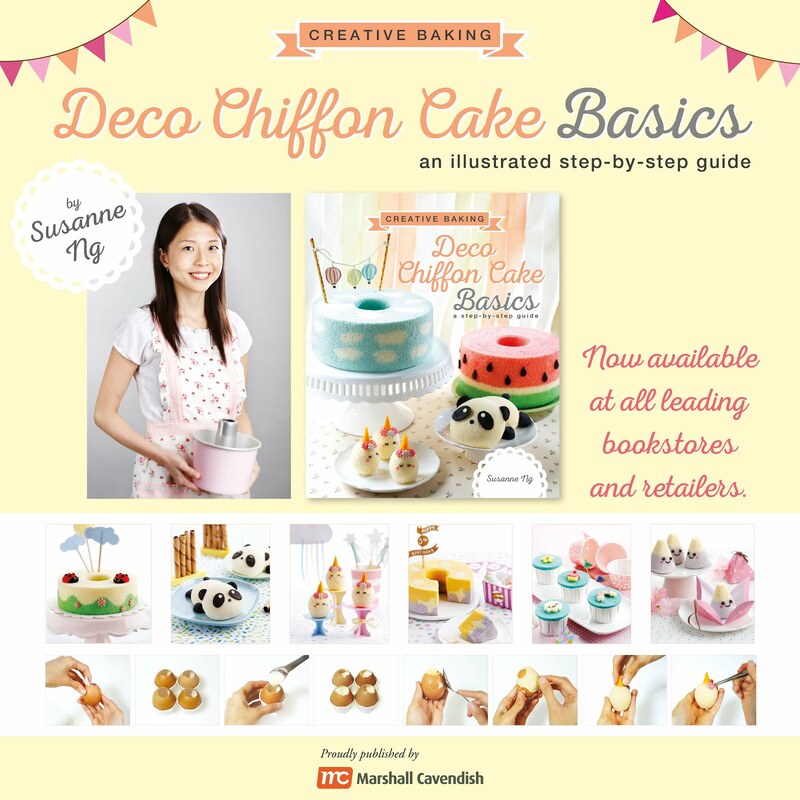 You may refer to my photo tutorial for shaping the cakes into orange shapes. Begin by using a citrus juicer to make an indent at the top of the hemisphere. Hold the juicer in place for several seconds before releasing it. If you find that the indent is not deep enough, repeat this step. 11. 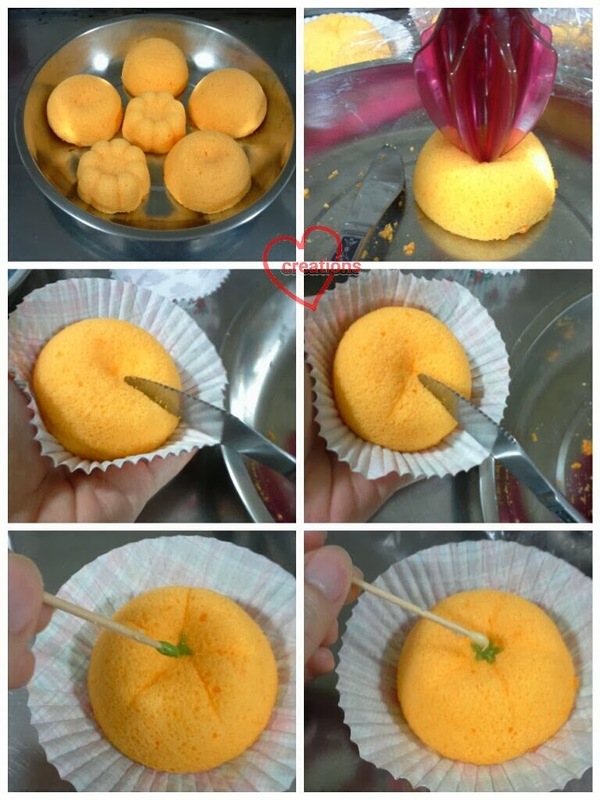 Next, gently gather/ pinch in the bottom of the hemisphere if it flares outwards too much to look like an orange, and place the cake on a paper cupcake liner. 12. Make the "wrinkles" at the top of the orange by using the back of a butter knife to imprint 5 indents. 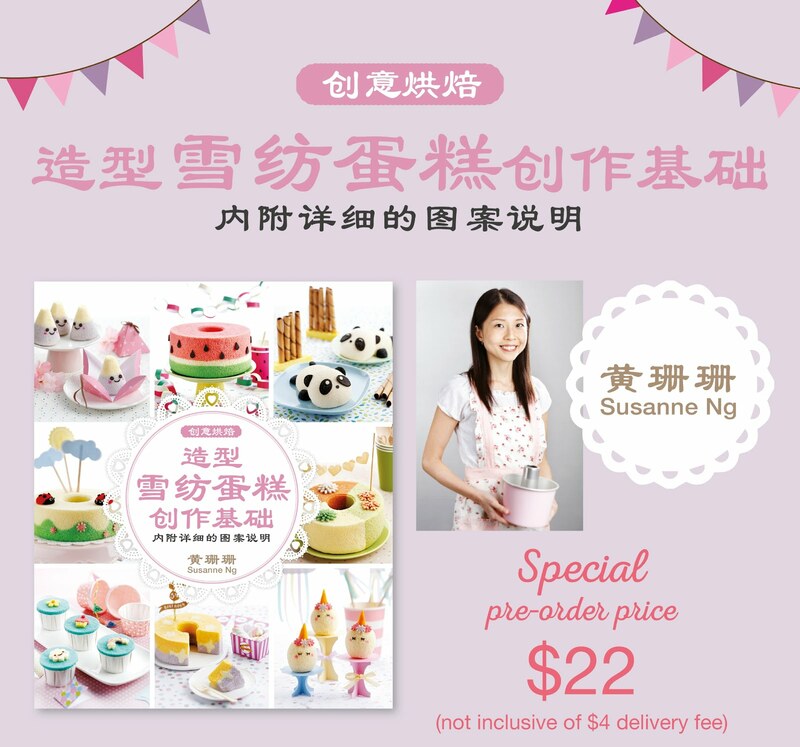 Hold the cake by cupping it with one hand and press the back of the knife firmly on the cake. Rock the knife gently forwards and backwards, and side to side to make the imprint. Repeat if necessary to ensure that the imprints do not disappear. 13. Divide the white chocolate into 2 portions and place them in small bowls. Place the bowls in a small saucepan of hot water and keep stirring until the chocolate melts and flows easily. Add some green tea powder to one of the bowls and stir until the powder and chocolate are well combined and smooth. You may pipe the "stem stubs" onto the oranges using piping bags but I prefer to use a toothpick to apply the chocolate for such a small volume. Draw a star in the middle of the orange using the green tea white chocolate. When it has set, add a drop of plain white chocolate at the center of the "star". I had lots of fun making these and I hope that you will too if you intend to make these to bless your family and friends during the next Chinese New Year. They are really cute and yummy! If you need more visuals for shaping the oranges, check out here for a video tutorial! I woke up one morning and had the sudden inspiration to dress up my chiffon pops as fruits! This was the very first of the chiffon fruit pops created! I had a very close group of mummy friends whose kids had just started N1, and wanted to gift these chiffon fruit pops to the kids for being so brave! 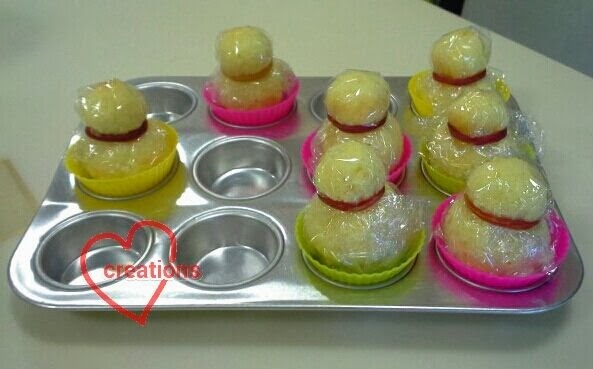 Since these were for kids, I went for strawberry yoghurt chiffon which is healthy and popular with kids. 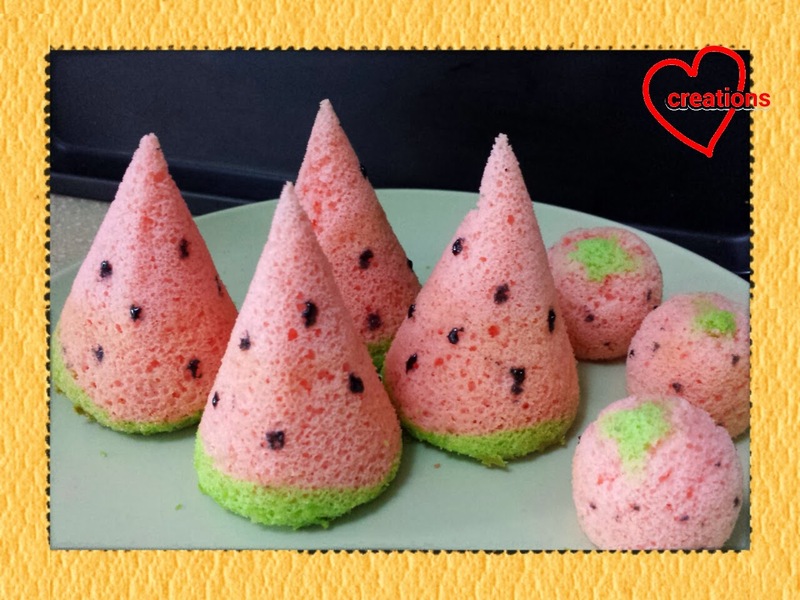 I baked the chiffon cakes in paper cones and egg shells similar to that of the rainbow chiffon cake pops to make the "watermelon" slices and "strawberries" respectively. I used food marker to draw on the seeds of the watermelon and let it dry. My recipe is now in Creative Baking: Chiffon Cakes book, out at all major bookstores! And here's a video tutorial for making the Watermelon Chiffon Cake pops! Very privilege to be shot by the pros at Smart parents.sg, mediacorp! I ran out of chocolate Pokey sticks at home so one of the horses have a wooden skewer stuck in it. Don't they look cute? They look good for birthday parties of kids who love horses too. I adapted the recipe from Susanne's rainbow cake pops but used orange juice instead and added Milo and cocoa powder to colour the cakes naturally. I used a small knife and sawing motion to gently cut off a bit of cake from the top of the "head" to create the ears. I used melted compound chocolate for adding on the horses' hair, eyes and nostrils. You may wish to pipe more chocolate on top and down the back of the horses' heads to form the mane. Let the chocolate air dry completely. 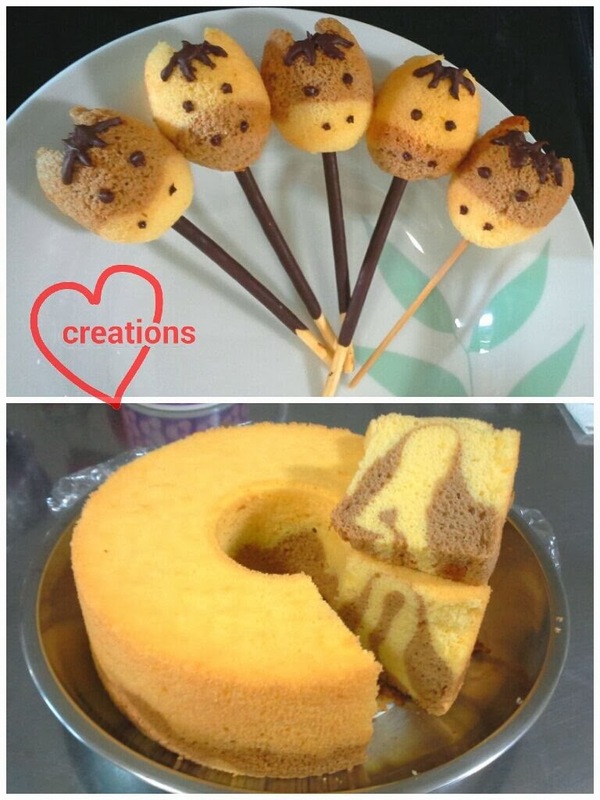 Use a toothpick or wooden skewer to make a hole at the bottom of the cakepop. Insert a biscuit stick into the hole when you are almost ready to serve to prevent the biscuits from going soft too much. 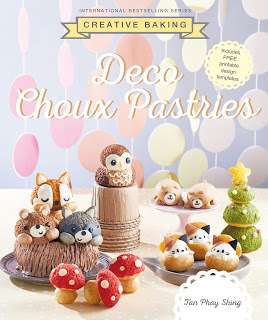 My kids had lots of fun eating these and couldn't help smiling when they see these cute cakes :). I hope they put a smile on your face too! I adapted the bao skin recipe from Guai Shu Shu with some modifications. I love it for it's simplicity (straight dough method), mild sweet taste and soft fluffy texture. I used the recipe from Rasa Malaysia for the char siew filling. 1. Mix all dry ingredients (flours, sugar, salt and yeast) together in a large bowl and make a well in the center. 2. Pour water into the well and use a wooden spoon to stir the ingredients together until well combined and a dough is formed. Pour out the dough onto a non-stick mat or lightly floured clean work surface and hand knead for 5 minutes (or you may use a stand mixer or breadmaker to help you do all the kneading but I prefer to knead by hand). Add in dissolved baking powder 1/4 tsp at a time and knead until it is absorbed into the dough. Stir the baking powder mixture as the powder tends to settle to the bottom after a while. Knead for another 5 minutes after all the baking powder has been added. 3. Knead the vegetable shortening into the dough in a few additions, making sure that the shortening is absorbed into the dough before adding more. After all the shortening has been added, knead for another 15 minutes or until the dough is smooth and elastic and passes the windowpane test. 4. Let the dough rest in a lightly greased bowl covered with cling wrap for about 30 minutes or double in size. Punch down the dough and knead a few times to release any trapped air. 5. Try to work quickly from this point onwards when portioning and wrapping the buns, keeping any resting portions covered loosely with cling wrap. Lightly flour work surface and hands to prevent the dough from sticking. Take about 1/5 of the dough and divide it into 6 portions, coloring each portion with the colors of the rainbow (pink, orange, yellow, green, blue and purple). Portion the rest of the uncolored dough for the pigs' heads. 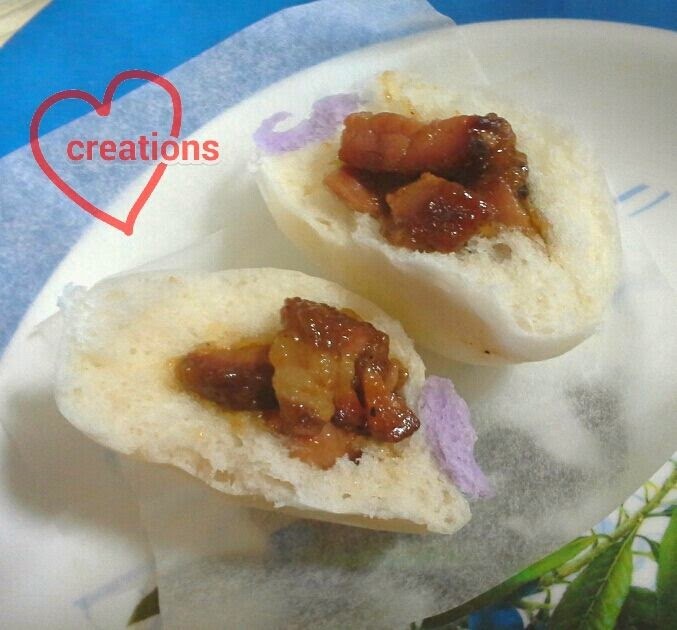 I chose to make super mini baos so I only used 16g worth of dough for each pig. You may make bigger buns using 30g of dough for medium sized ones or up to 50g or more of dough for big buns. 6. Use a small rolling pin or your hands to flatten the ball of dough before adding the filling. Make the edges thinner than the center of the dough. Pinch seal the dough after wrapping with filling and place the pinched side down on a small piece of baking sheet. 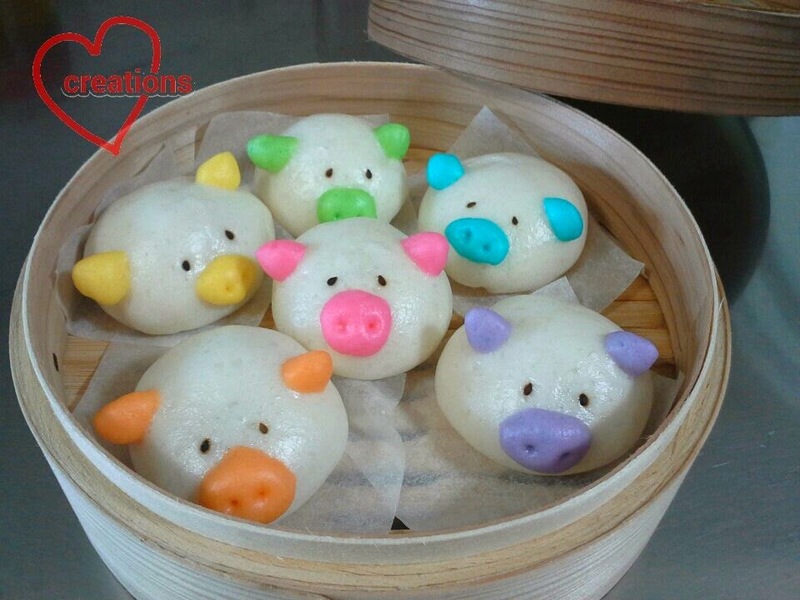 Pinch a bit of colored dough to make the snout of the pig, using a toothpick to shape the nostrils. Attach the snout to the center of the pig's face. Pinch a bit of colored dough and shape into small triangles for the pig's ears. Attach black sesame seeds onto the pig's face for the eyes. Use a toothpick to press the seed into the dough to secure it. 7. Place the wrapped buns in a steaming basket and cover them loosely with cling wrap to prevent them from drying out. Proof for 30 minutes. 8. While the buns are proofing, prepare a wok or steamer for steaming. Make sure the water is boiling before putting the buns in to steam. Steam small buns (30g or less of dough) for 10-12 minutes and larger buns (50g or more of dough) for 15 minutes at medium heat. Turn off the heat and let the buns rest for 5 minutes before removing the lid. 9. Steamed buns are best eaten freshly steamed. If you are not consuming them immediately, store them in an airtight container after they have cooled down completely before freezing them. When you want to consume the stored buns, re-steam them for 15-20 minutes (depending on the size of your buns) straight from the freezer. They will taste just as good as freshly steamed buns :). Here's a peek at the insides of the char siew bao!